The first day of Navratri is dedicated to the Durga Shailputri aspect of Goddess Shakti. ‘Shail’ means mountains or rock and ‘putri’ means daughter. 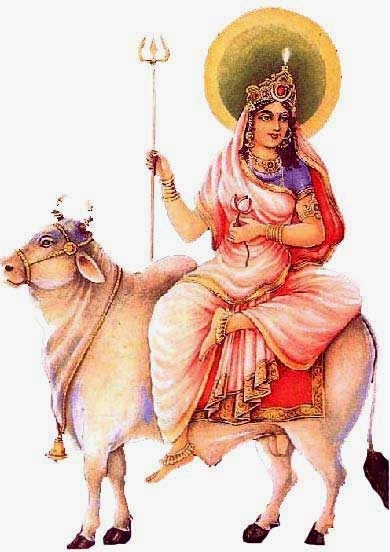 She is worshipped on April 6, 2019 during Chaitra Navratri. Generally, Shailputri is associated with Goddess Parvati. She is usually considered as the first Durga among the Navadurgas or Nine Durgas. In many places, the first three days of Navratri is dedicated to the worship of Goddess Durga. In some regions, the first day is also dedicated to Amba. Shailputri is generally depicted as two-armed and carries a trident and lotus. Her mount is a bull. In her previous incarnation, Shailputri is believed to be the daughter of the king of Mountains, Himalaya. This is one of the very first forms of Shakti and is closely associated with Lord Shiva. She has influence over Chandra or Moon God. Thus she can influence the mind of a devotee. The direction associated with her is northwest. She has an influence on the fourth house of a person's Kundali or horoscope. Thus she can bless a devotee with house, vehicle, happiness, and property. Ghatasthapana or sowing of barley seeds and Kalash Sthapana also begins on the day. Some devout Hindus light a lamp on the day and keep it continuously burning for next nine days. Vegetarian food is only consumed for nine days. Some people walk without footwear for the next nine days. She should be offered Ghee lamp. Dhoop should have the smell of mogra or jasmine. Flowers offered should be white or yellow in color. Food or Bhog should be made using Cow ghee or Mava. A portion of the bhog should be given to a young girl.